In the Cathedral of Napoli (Naples). 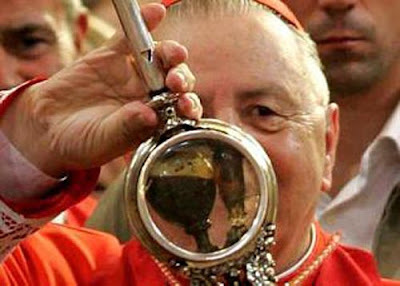 There is a sealed glass ampoule containing the clotted blood of San Gennaro (St Januarius), this glass is shown several times a year to a crowd Whilst the container is being handled during a solemn ceremony, the solid mass suddenly liquefies before everybody's eyes. Even though this phenomenon is well-documented and is still regarded as unexplained by believers and skeptics alike, the mystery has not yet fully explained. One of the theories that might explain the phenomenon is called Thixotropy which is the property of certain gels to become more fluid, even from solid to liquid, when stirred, vibrated, or otherwise mechanically disturbed. We wanted to be sure about this fact also and the Masters of Light answered the phenomenon. THE LIQUEFIED BLOOD OF ST. JANUARIUS. Interlocutor: ... Here I have scheduled a question related to the liquefying blood of St Januarius, the pattern of Naples, Italy. The strange thing is that this phenomenon takes place twice a year, on September 19, the day of the Patron Saint, and the first Saturday of May. My question is it is something related to a trick of the Catholic Church or the spirits of Error act here. Doctors say that it is truly blood, but they ignore why the liquefaction process takes place. Ruanel: No, it is not a trick from the Church. They would be very clumsy if they made something like that because they would have been exposed already. Interlocutor: Then, What happens here? Ruanel: In three cases, at least, one in Italy and two in the Iberian peninsula, there was extraterrestrial intervention, beings whose purpose, we repeated, it is always the subjection through reverential fear. Ruanel: They don’t need to travel so much, because there are extraterrestrial bases that respect to each other, as much at the belt of asteroids as in the moons of the biggest planets. They arrive to the Earth within minutes! Ruanel: It is the same thing that happened during the Stone Age, when the aliens, for the single fact of having a ray gun, they were revered as gods and they offered them food, their goods and even their wives. Ruanel: You have said it... With regard to the liquefying blood, reasonable people, instead of kneeling down foolishly worshipping the Saint before an alleged miracle, they should take the blood to a laboratory so that they could analyze it and discover why the blood is liquefied in certain dates. It doesn’t matter if they discover it or not, but the purpose should always be considering merely as a scientific event. It is a silly thing attribute the liquefaction process of the blood to an alleged miracle of the saint... please! This entry was posted at Friday, August 21, 2009 and is filed under Mysteries and Enigmas . You can follow any responses to this entry through the .